I may or may not be writing this under the influence of a tiny little half of a Norco. 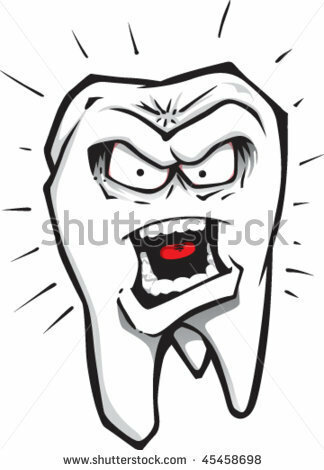 Also, thank GOD for understanding dentists who can see right through my Registered Nurse bravado into the little girl inside crying, wailing, "Dentists scare the **** out of me!!!" It all started, boys and girls, back in September. I noticed that I was able to reach right down into my molar and touch flesh. So I got it packed up by a lovely, lipsticked dentist who was kind and friendly and even gave me a hug. She said that I would need to come back and have it taken care of in a more permanent fashion. Did I do that immediately? Nope. The lack of health insurance plus starting a new full-time job was enough to keep me away, even though my lovely parents offered to help. They have helped SO MUCH that I feel completely awful going back to get something done that wasn't even bothering me anymore. So I let it wait. And then work and life got busier. And busier. And busier. One day at work, boys and girls, I was chewing on a Quaker chewy granola bar (it's not your fault at all, Quaker), when I suddenly crunched down on a SUPER crunchy chocolate chip. Guess what, kids? Not a chocolate chip. I got to see what half a tooth looked like! Yay! Then the filling started coming out, piece by piece. Still no pain, no irritation other than the rough edge rubbing on my tongue a bit. I let it wait. Bad move, y'all. "YOU WILL NOT BE IGNORING ME!!!!" Then, boys and girls, yesterday afternoon I started using the Orajel a little too much. It wasn't working. I took more ibuprofen than is good for any human, and no relief. I slept fitfully (meaning not at all), knowing that in the morning I would have to call in to work, because I wasn't safe for my patients with the pain that I was in. I was all over the internet looking for 24 hour dentists. Ice pack, hot pack, flipping back and forth unable to find a comfortable position for my half-tooth - it was a very long night. This morning I called a dentist that I found on Yelp (do you know of it? You HAVE to try it.) The lady was very kind and concerned and called me back in 10 minutes, saying, "Yes, please come in at 9." They took X-rays, and I saw for myself the awfulness of what I was facing. The decay had weakened my tooth, and had infiltrated the entire thing. It's time for a root canal. I go back at 2 pm today. The lovely gentleman dentist saw right through me, and prescribed me "happy pills" and promised that he would "numb the living hell" out of my tooth so I wouldn't feel a thing. I love him already. To be continued.......because here I go. When I got back to the office, I was a bit anxious. Then the happy pills kicked in plus the buttload of Novocaine applied so lovingly to my gums and palate. There was also Food Network on a ceiling television. Nothing like watching someone make mouth-watering BBQ ribs while you're unable to chew. I remember most of the procedure, and he was gentle the whole time, and afterwards the X-rays showed a beautifully filled tooth. Of course, I do need to go back in for a crown in a couple of weeks, but it's DONE, folks. 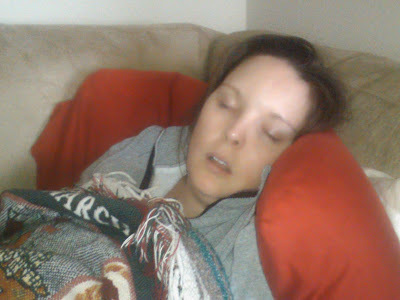 The Man picked me up from the dentist's office because I would have gotten lost on the way home, and I immediately passed out when I hit the couch. I woke up briefly for a bowl of most excellent mac-and-cheese, then fell back asleep. Which, boys and girls, usually leads to embarrassing cellphone pictures taken of you, slack-mouthed and drugged up. I haven't killed him. Yet. This morning I woke up in minimal pain. While we were out to breakfast, the dentist himself called to make sure I was still alive. I love him for this, and he has earned himself a forever-patient. Do you have a favorite physician or dentist? What has your physician done to make you feel loved? EEEEEKS!!! I hate all things teeth. I have a very old metal filling that is coming loose. My dentist is going to "give it a face lift" meaning he's going to dig it out. Then he promised drugs...and then I eagerly signed on the dotted line. I hope that you're feeling better. Tooth pain is no joke. This is really strange, Corinne. Hey there, You've performed a fantastic job. I will certainly digg it and for my part recommend to my friends. I'm confident they'll be benefited from this site.